Like many I have been waiting three long years for this DVD to be released. Immortal's 2007 reunion tour, culminating in the seventh date at Wacken Open Air, was a landmark in black metal history as one of the genre's biggest names finally took to the stage once more. I was in attendance on this historic date in Northern Germany. Unfortunately so were about 70,000 other metalheads so actually seeing the band was a real effort. 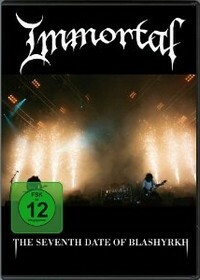 Thankfully with the release of this DVD I can finally see Abbath & co. destroy the Wacken stage! The concert itself is a good representation of Immortal's discography prior to the release of All Shall Fall. Sure, not all albums are represented but most of Immortal's most popular songs are included, including At The Heart Of Winter, Battles In The North, Sons Of Northern Darkness and Blashyrkh (Mighty Ravendark). The visuals and sound are exceptionally clear - as one would expect from a DVD recorded at Wacken - with a multitude of camera angles, close-ups, crowd shots and more. All of the great moments from the show are included, such as Abbath's fire-breathing, the mid-song breaks to lap up the audience reaction and the legendary random 'bleh' from Abbath during the intro to At The Heart Of Winter! However, the extras on this DVD are as sparse as the frostbitten wastes from whence this band originate. There is a CD included which contains the show in audio format but apart from that, nothing. In this day and age where the likes of Amon Amarth's Wrath Of The Norsemen and Gamma Ray's Awesome Foursome DVDs are packed full of interviews, extra shows, behind the scenes footage etc it seems a little backwards to include sod all on such a landmark release. This is Immortal's first ever real, official, purpose-recorded live DVD and there's not one extra! However, one thing that must be said of this DVD is that it is an exceptionally honest recording. There has been no attempt at hiding Abbath and Apollyon's fading makeup, nor the dud notes and mistakes that permeated the show. Some people may claim this is unprofessional but to me this adds to the charm of the show. Metal isn't supposed to be perfect! Its supposed to have balls and attitude and this show certainly shows this side of the music! For the life of me I cannot figure out why this DVD took three years to see the light of day. I'm a little disappointed by the package as a whole but the show itself – the main reason to buy a music DVD – is amazing and brought back so many memories of that great day in 2007! During the last months a lot black metal album got released, but it seems that the quality is linked with the quantity... Unfortunately more releases don't mean better quality, actually many releases are below average. Luckily Immortal know their business and released with Sons Of Northern Darkness one of the best black metal albums in quite awhile. That Peter Tägtgren did an excellent job with the production isn't a surprise. He's one of the best producers in the genre, perhaps coz he's a musician, too and with Hypocrisy pretty successful. The title track as well as the neckbreaking One By One is showing their technical skills. With Sons Of Northern Darkness they proof that they are one of the premier league black metal bands. Beside neckbreakers they have also some mid-tempo ones like Tyrants. You might think of Bathory when you listen to the mid-tempo tunes... 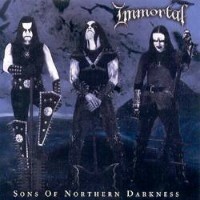 Anyway, Immortal play superb black metal. They are the new kings of black metal! Long live the kings! The production was done by famous Peter Tägtgren. No more to say about the production. Or does anybody doubt it? So, this is a must buy for all black metal fans!